Dress 4, originally uploaded by the workroom. If you’re looking for a simple and quick dress pattern, this is a good one to try. There are no sleeves, no zippers and no darts in this dress. But even still, it fits very nicely. The encased tie around the waist cinches the fabric into pretty little gathers across the back side. The tunic has a very Grecian look, in my opinion. I made three adjustments to the original pattern. When cutting out the fabric, it seemed like the skirt was going to be way too long, so I shortened the skirt pieces. Once I finished the dress, I realized I had shortened it a bit too much. I would have preferred to have a couple more inches in length. Next time I do this pattern, I’ll cut it out exactly as they have it printed. After I put the dress together, the skirt was a bit too a-line for my liking. I felt that the silhouette would be better slightly straighter, so I ended up bringing the skirt in a few inches around the bottom. The pattern also called for store-bought bias tape for the neck line and the arm holes. I made my own bias tape using the Anna Griffin fabric. Bias tape is the easiest (and dare i say, funnest?) thing to make. The key is using the right tools, the most important being a bias tape maker. I promise a little tutorial very soon on bias tape. I want you to love it as much as I do. The Blythe line from Anna Griffin is filled with fun prints like maps, calligraphy, engraved drawings and botanical studies. I especially like this fabric because it feels like I’m wearing a vintage flower catalog. What are your thoughts on the ‘proper’ thing to wear under a dress with no lining? Do you wear/own slips? Do you have another solution? Do you care? For me, it usually depends on the show-through factor of the fabric, especially on light-coloured ones. I’m thinking that I’d like to make a few simple cotton slips to go with my growing dress collection. Hmm… foundation garments may be the next personal sewing challenge. oh karyn, you make me want to learn, make, and be as generally great as you. and why do you look so amazing in absolutely everything? anyway, i am a big fan of the slip. i find them most useful in my quest to wear dresses all fall and winter – slips make it possible to wear stockings with less dress bunching. to this end, i find cotton useless and usually go for synthetics (and i generally hate synthetics). if you are able, i also highly recommend silk. i used to have a special hook-up for custom silk slips (my dad worked in lingerie) and i was hooked. you have to wash them by hand but silk is a super-fiber: static reducing, insulating, and breathable. wow, i guess i inherited some underwear passion. who knew? don’t even get me (or my dad) started on the correct fit of a bra. i remember being in class and you had mentioned that you were going to start this pattern. it turned out really nice! i have a vintage dress in a similar shape. i might have to purchase this pattern and try it out. i sometimes (depending on see-throughness) wear a slip that i stole from my mom some years ago. it’s a bit too hot to wear under summer dresses though…i’ll have to find a light cotton slip for such ocassions. Is this the pattern I tried? I couldn’t get the hang of the cinched waistband, but it looks so cute! Maybe I’ll try again. I just make a little belt to tie around it. becky – Hmm, you bring up some excellent points regarding slip fabrics. I think that especially for fall/winter weather that cotton will not do. I will look into some silk options or perhaps this might be a good place to consider bamboo or soy, they seem to be very silky fabrics from what I’ve seen. concha – thanks! I hope you will try it, it’s very easy to make. rizie – I’d love to see your vintage version of this dress. I bet it’s really cute. 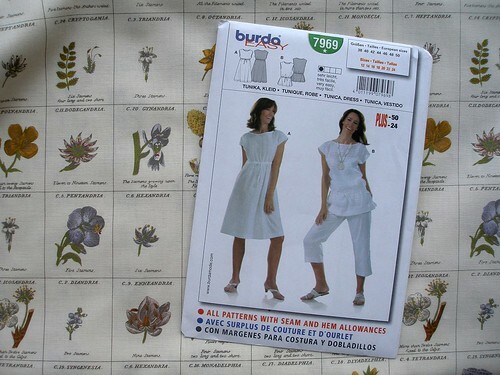 Melinda – Yes, this is the pattern like the one you got on Burdastyle. The cinched waistband is pretty easy, it’s just a strip of fabric sewn onto the waist and you slip the tie through it. I don’t often wear belts, so it’s great to have the tie enclosed. I never have to worry about losing it… Your yellow version of the dress turned out really sweet and I loved your belt solution.